Indeed, in the days prior to the establishment of Calvin’s Academy in Geneva in 1559, the preeminent place of study in the pays de Vaud was unquestionably Lausanne. The Academy turned out countless pastors for the Reformed faith, and aside from the preachers who left the Academy to proceed as missionaries to the surrounding Roman Catholic countries were many world-renowned men of the Faith who also received their training at Viret’s school. 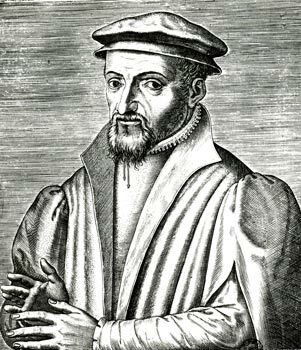 Some such students included Zacharias Ursinus and Casper Olevianus, authors of the Heidelberg Catechism of 1562, and Guido de Bres, author of the Belgic Confession of 1561. On a providential day: October 31, 1517, a humble protest by a conscientious monk and University Bible professor named Martin Luther set off a chain of events which changed the world and altered the course of history. Let us take time to reflect on a mighty work of God in the past and its contemporary relevance. 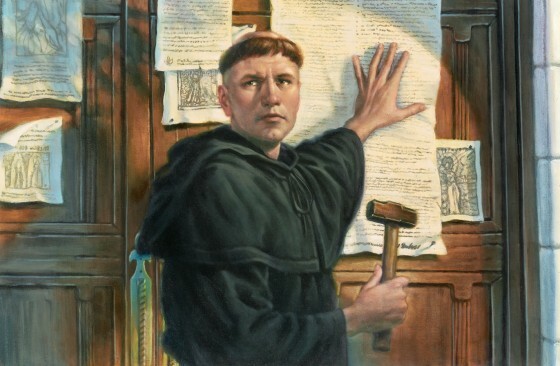 Topic: What was the Protestant Reformation? Why was it necessary? And what does it mean for us today? Come and join us for a discussion followed by a question and answer period and special music from the Hope Congregational Church Choir. No RSVP needed. Bring a friend. You won’t want to miss this historic occasion. Exodus 15:1 I will sing unto the Lord, for he hath triumphed gloriously: the horse and his rider hath he thrown into the sea. If Christianity is True, Why Are There So Many Different Churches? : Part 3, History Has a Lot to Do with It. Our discussion of the fact that there are many different Christian churches would be remiss if it did not include a look at the history behind the various splits and divisions. For the first few centuries of Christianity, there were different churches in different locations, which more or less had fellowship and communion with one another. In those early centuries a hierarchial structure developed whereby the most important cities in Christendom were led by archbishops. The most important centers and archdioceses were eventually Jerusalem, Antioch, Alexandria, Constantinople, and Rome. Now and then councils of bishops were held representing the entire Church to respond to false teaching that had crept up in part of the Church. 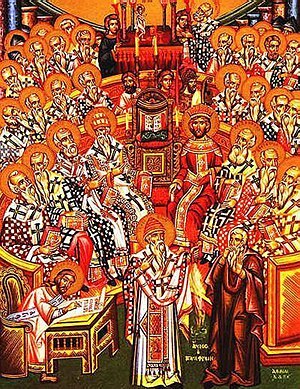 The councils of Nicaea (AD 325), Constantinople (AD 381), Ephesus (AD 431) and Chalcedon (AD 451) are examples, which produced what we know today as the Nicene Creed and the Definition of Chalcedon. These statements about the Holy Trinity and the person of Christ are still important and instructive for us today, subordinate to the Scriptures. Those who could not adhere or subscribe to the documents produced by the councils were considered to be heresies or departures from the true Christian faith. The Church which was unified on the basis of the foundational doctrines of the Triune God and of Christ expressed in these documents was in those days known as catholic, meaning universal or as Augustine put it, “that which has always and everywhere been believed by all Christians” and orthodox, meaning that she followed straight doctrine. For the first millenium of Christianity, then, there was basically only one truly Christian Church extending from Britain and Portugal to North Africa and Palestine. Although many things varied between churches from city to city, and province to province, there was a basic organizational unity and fellowship among Christians professing the true faith handed down from the apostles. The first and the largest split in the history of Christianity occurred in 1054 A. D. when the western church split from the eastern church, known as the “great schism.” Although there was sadly a good bit of political motivation behind the division, on the surface the split involved the question of whether the phrase “and the Son”, known in Latin as the filioque, belonged in the Nicene Creed. It was not part of the original document but it had been added in the West to express the biblical teaching that the Holy Spirit proceeds from the Father and the Son. Eastern theologians disagreed, and still disagree to this day. There was also a dispute over whether it was proper to use leavened or unleavened bread in the sacrament of Communion, and over whether the bishop of Rome, aka. the pope, was the universal bishop of the whole Church. Ever since the schism, the eastern church has come to be known as orthodox and the western church as catholic. 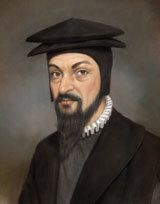 Reformers like Martin Luther, Ulrich Zwingli, John Calvin, William Tyndale, John Knox, and Thomas Cranmer brought and preached the Bible in their home countries including Germany, France, Switzerland, England, and Scotland. The Bible was translated into the languages of the people from the original Hebrew and Greek so that they could understand the Scriptures for themselves. Worship was held and sermons were preached in the common languages of the people. Instead of basing the Christian faith on the great mass of tradition that had accumulated over the centuries, these Reformers looked to the Bible alone as the final authority and standard for the Christian faith. The Reformers kept those traditions which were based on Scripture and threw out the rest so as not to throw the baby out with the bathwater. Since the Roman Church had rejected the Reformers and their teaching, new churches were established in many countries, wherever the gospel was heard and believed in purity. Although divided by geography and sometimes by some of the finer points of doctrine, these churches, known as Protestant, held the basic Christian faith in common. 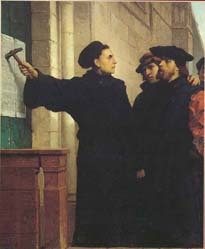 By rejecting the doctrines of salvation by faith alone and the unique authority of the Holy Scriptures at the Council of Trent ( AD 1545-1563), the Roman Church, commonly known as the Catholic Church, departed from the true Christian faith handed down from the apostles. Sadly she still rejects these important pillars of the true Christian faith of salvation by faith in Christ alone and the Scriptures alone as the final authority, even today. The Protestant Reformation birthed such churches as the Lutheran, Reformed, Anglican, Presbyterian, and Congregational churches divided by geography and sometimes certain matters of doctrine or practice, but united on the basics of the gospel. Over the years, further movements and divisions within the churches of the Reformation produced other churches such as the Baptists and Methodists with their own distinctive emphases during the 1600’s and 1700’s. The 1800’s saw a number of cults started by powerful personalities or self-appointed prophets who gathered their own following, especially in the United States, many of which groups continue until this day. In the 20th century, many of the Protestant churches had become infected with liberal theology which undermined the pure faith based on the Holy Scriptures that had characterized the churches of the Reformation. Many churches were influenced by modern trends like evolutionary theory, “higher” biblical criticism, feminism, and sexual “liberation.” But in several cases a remnant of true believers remained to carry on the heritage of faith in those churches or break away and form new denominations to bear the old name and faith. The charismatic/pentecostal movement attempted to recreate the experiences of the apostolic age, counter to a biblical understanding of God’s plan for redemptive history, I believe. And many independent churches were established, with no official ties or fellowship with any other congregations. Here is a quick summary of the historical circumstances which led to the plethora of churches and denominations that we have today. So here’s what has happened. That leaves us to consider God’s ultimate purpose in it and offer some practical considerations. To be continued.